This is one of a limited edition of signed and numbered prints made by the artist for Light Work's Fine Print Program. Since 1991 Light Work has sold limited edition prints to benefit all of our activities. The generosity of our former artists and friends makes it possible for us to continue our support of emerging and under recognized artists working in photography and related media. Keliy Anderson-Staley arrived in Syracuse with all the equipment and materials she needs for her work with the wet plate collodion process, the leading mode of photography in the 1850’s and 1860’s. During her residency, Anderson-Staley will create tintypes of Syracuse residents as part of her ongoing series, Americans. The artist will process the tintypes in our dedicated Artist-in-Residence black-and-white darkroom using chemistry hand-mixed from 19th-century formulas. She also plans to use a portion of her time to scan negatives from a variety of series of work using our high-resolution Imacon scanner. Americans investigates the essence of photographic representation and how it has influenced and informed issues of cultural identity both historically and today. 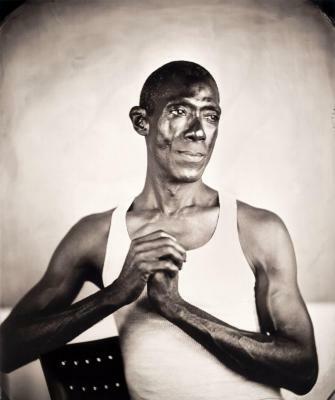 The wet plate collodion image captures a pose held over several seconds or even minutes. This prolonged gaze creates a tension between the sitter and the camera. While a snapshot captures a moment about a 1/1000 of a second long, the tintype process allows for a portrait to unfold over time; the image produced can then slow down our process of looking. As was the case in the 19th-century, the shoot becomes an event, a performance, in which the camera, the chemistry, the photographer and the model all come together to preserve a face for posterity. If you are in the Syracuse area in August, Anderson-Staley invites you to have a tintype portrait taken at the Light Work/Community Darkrooms studio between August 5 and 28. Anderson-Staley will explain the process while producing the images and will send a digital scan of the portrait to each sitter who provides an email address. All are welcome, but appointments should be scheduled in advance with the artist at keliyas@gmail.com. Sitters will be asked to sign a model release. Keliy Anderson-Staley has a BA from Hampshire College in Amherst, MA, and an MFA from Hunter College, NYC. Her work has been exhibited at California Museum of Photography, Riverside, Flomenhaft Gallery, NYC, The Print Center, Philadelphia, PA, and The Bronx Museum of the Arts, NY, among other venues. The exhibition Contemporary American Portraits: Abe Frajndlich, Eric Klemm, Mary Ellen Mark and Keliy Anderson-Staley opens January, 2010 at Focus Gallery, Cologne, Germany. They loom out of the darkness, as if hovering uncertainly between past and present, offering themselves for our scrutiny with an intensity that borders on the confrontational. Part of it is the look these people give us, staring at the camera for as long as sixty seconds and more, resulting in a kind of clenching of the eyes (as a sitter, you become aware of the sheer physicality of looking under these conditions, of the need to fight your eyes’ desire to wander). Part of it is the texture of their skin, turned into rugged planetary surfaces by the tintype’s peculiar response to color and high resolution of detail. And part of it is the differential focus with which the subjects are depicted—sharp in some places and strangely liquid in others—as if their bodies are floating in a primordial wet world with just the faces breaking the surface. For all these reasons, Keliy Anderson-Staley’s tintype portraits are best described as otherworldly, rather than antiquarian. The tintype, an American invention, was introduced in 1855 and continued to be widely used until the 1930s, making it one of the most enduring of photographic processes. The selection reproduced here is part of a collection of hundreds of contemporary examples taken by Anderson-Staley. Among their other attributes, these portraits—each designated only by a first name and the year of exposure—offer us a survey of race, gender, and age that considerably expands the primarily Caucasian version of American society recorded in nineteenth century tintypes. As a collodion negative developed on a small sheet of lacquered metal, a tintype has the appearance of a positive print but no possibility of being reproduced in multiple manifestations. Each tintype is, in other words, a unique object. As a mirror image, tintypes also show an inverted version of their subject (what appears to be a right hand is in fact the left, and so on). To make her tintypes, Anderson-Staley uses hand-poured chemistry that she mixes herself according to nineteenth century recipes, period brass lenses, and wooden view cameras to expose positive images directly onto blackened metal (usually aluminum) and glass plates. Exposure times are long by today’s standards, and many of her sitters have made use of a hidden metal posing stand, its cold extensions holding the head steady as the seconds tick interminably by, counted off by the photographer. Perhaps that is what is most striking about these pictures: The people portrayed still appear to be growing into them, still seem in the process of becoming themselves. In this way, Anderson-Staley’s work transcends the undoubted curiosity value of her chosen medium. Before they are tintypes, these pictures are portraits, portraits of contemporary Americans (perhaps, even, when seen collectively, a portrait of contemporary America). As such, they raise the whole question of photographic portraiture, of what exactly can be deduced about an otherwise unknown person from a mere picture of his or her face. The pictorial qualities of the tintype, its obvious artifices and self-conscious accentuation of surface appearance, make these questions unavoidable. They remind us of what we already know: that a photograph represents a truth-to-presence (it certifies that a person was once there before the camera, in some past moment in time and space), but not a truth-to-appearance. These tintypes do not look much like the people they represent; the process itself results in visible deformations of form and feature. And yet these same people seem so much more present than the subjects of other kinds of photographs, in part because the passing of time between then and now—a feature of all photographs—seems here to be flowing before our very eyes. In simultaneously drawing attention to both the medium’s pictorial deceptions and its temporal peculiarities, these pictures insist that our relationship to photography hinges, not on truth, but on desire—on our own desire to transcend time and space by means of the magic of the photograph; to, as it were, cheat death. In short, the work of Keliy Anderson-Staley is an open invitation to see much more than meets the eye. 1. Walter Benjamin, ‘Little History of Photography’ (1931), in Michael W. Jennings, Brigid Doherty, and Thomas Y. Levin eds., The Work of Art in the Age of its Technological Reproducibility, and Other Writings on Media (Cambridge, MA: Harvard University Press, 2008), 279-280. Keliy Anderson-Staley participated in the Light Work Artist-in-Residence Program in August 2010. For more information, visit www.andersonstaley.com. Geoffrey Batchen teaches the history of photography at Victoria University of Wellington in New Zealand. The title of the project, (hyphen) Americans, alludes to the split character of American identities (Irish-American, African-American, etc. ), while only emphasizing the shared American identity. Therefore, although the heritage of each individual might be inferred from assumptions we make about features and costumes, the viewer is encouraged to suspend the kind of thinking that would traditionally assist in decoding these images in the context of American identity politics. When we look at tintypes made during their era of invention from the late nineteenth century we see the same rigid, stoic, and serious postures and expressions repeated in Keliy Anderson-Staley’s tintype portraits from our current time. Tintypes require long exposure times between fifteen and sixty seconds. So the stoic faces and stern gaze of our ancestors didn’t describe the quality of their life or the temperament of their character, but were simply the outcome of trying to stay still. Anderson-Staley leveled the playing field of time by collapsing the separation in distance and perspective using a common photographic process. Because we will accept that we possess a more hopeful range of emotion and outlook on life than our ancestors, her portraits explode the myth that photographs describe an absolute truth. At the same time we embrace that photographs are powerful markers of moments and memory and that their power to establish identity, define place, record history, and convey meaning always lies somewhere between a point of view and a universal perspective of representation. There are easier ways to make portraits that would allow Anderson-Staley to achieve her goals in defining difference than the laborious process of making tintypes. The wet plate collodion or tintype process is an American invention that was popular from 1855 to the 1930s. It requires skill and speed where the photographer coats a metal plate with light sensitive material and then must expose the plate before the chemicals dry and then immediately process the plate in a chemical bath. There is no enlargement or other steps involved. Her original plates range in size from 5x7" to 11x14" and each is a unique object hung on the gallery walls without a frame or adornments. That each image is a one-of-a-kind object gives them a precious quality that we associate with hand-made objects and accomplishes what she wants to say with methods that compliment how those ideas become whole. Photography has always been a blend of art and science continually being redefined by technology and reinvented by artists in an ongoing struggle of embracing change and lamenting the loss of familiar tools and processes. As technology becomes more sophisticated the pace of change quickens and some artists panic as their familiar tools, materials, and processes become obsolete, while others embrace the possibility of the new. The possibility of renewal has been a continuous quality of photography since its invention, always seeming to stay current and close to our perceptions and descriptions of the world around us. Photography records and reminds us of our experiences and memories here and now because it is rendered in a language of the present. That we choose to accept photographs as a firm record or only as an approximate representation is often only a matter of distance in perception than a measure of certainty. In Anderson-Staley’s tintype portraits she compresses time in order to explore that distance between perception and certainty. On the surface the use of an antiquated photographic process might recall a sense of nostalgia like old time photo booths at county fairs where sitters dress like settlers and cowboys from the Wild West. But she is not interested in nostalgia and her choice of the wet plate collodion process is indicative of her interest in a hands-on process that also becomes a performance as she engages her subjects in the special spectacle of having their portraits made in such an intimate and engaging way. Anderson-Staley acknowledges that history is a subjective and selective view of a finite past, and has stated that, “Our identities are linked to the visual history of social difference, a history in which photography has not always played an innocent role.” In the process of creating a series of portraits that recall the past while looking forward she expresses her view that a common human condition can emerge from the fragments of the past to shape the identities of the future.